Don Morgan, 44, a fire captain was nearing his twenty-year anniversary of working for the Los Angeles Fire Department in 1982. The date, April 12th, coincided nearly with his birthday – April 11th. In charge of the city's station at Los Angeles International Airport, he also flew regularly, taking family and friends on trip to locales throughout Southern California. One such trip was on April 9th, 1982. Flying a Cessna 177 “Cardinal”, registered as N30162 and owned by Airesearch Flying Club, he was headed for Santa Catalina Island, 26 miles off the coast, for the upcoming Easter holiday. But before departing on the initial flight from Los Angeles, Morgan drained a large amount of water from the fuel tanks. Using the plane’s internal battery power, the plane’s engine started without incident, and the three aboard: Morgan, his teenage daughter Michelle, and another middle-aged man, flew to the Santa Catalina airport where they had lunch. From there, they flew to Torrance, CA, and refueled with 27 gallons of 80/87 octane fuel before returning to Los Angeles. But, during the departure from Torrance, the plane was observed in a shallow climb to the north. During the climb, the engine was heard to decrease in power. The aircraft entered a steep bank, the bank was shallowed out, and then a steep bank was reentered. After that, the nose dropped, the aircraft nosedived into the southbound lanes of Hawthorne Boulevard. Stan Jonekos, manager of Torrance Municipal said the pilot did not answer calls from the tower asking if he needed assistance. 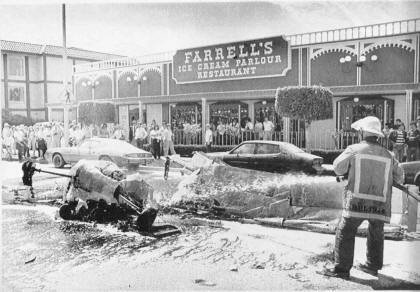 At 12:40 in the afternoon, it crashed and burned on Hawthorne Boulevard, a short distance from the sprawling Del Amo shopping center, and right in front of Farrell's Ice Cream Parlour. The impact sent flames 100 feet high and a fireball rolling down the restaurant-lined street. Iris Sicuro, an 18 year old waitress in the ice-cream parlor, said the plane exploded on impact and "went up like a mushroom…" Sicuro said she saw an arm come out of the plane and it appeared someone was trying to get out. She said the heat could be felt inside and the "whole restaurant jumped up and everybody left without paying bills. They panicked I tried to keep everyone inside because the heat was intense"
Robert Pierce, a 36 year-old employee of the ice cream parlour, said, “I thought it was an earthquake The lights were flashing and we could feel the heat inside." "I saw this inferno outside and I thought, 'Oh my God, we're going to burn down,'" said 22-year-old Kim Booth. Amazingly, no one on the ground was injured– but several parked car was scorched and destroyed. "It was just a miracle," said Police Lieutenant Larry Robinson, that no one was injured. "That's a very busy street, but there was just nobody right there fortunately." Among those who escaped injury were a group of children who were having a birthday party around a table next to the front window. A man who was videotaping the party turned his camera on the crash and the film was shown on evening newscasts. It was more than two hours after the crash before rescuers were able to get close enough to the flaming wreckage on the city's south west side to retrieve bodies. While police and fire crews were clearing the scene, a man stopped his car in the middle of the street and ran toward the plane crying, "Oh God, that's them." He was restrained by officers and collapsed in their arms. The man later was identified as one of Morgan's sons. The fire was so intense, the coroner's office said it would be unable to establish positive identities until dental records were checked. The National Transportation Safety Board’s examination of the wreckage and a disassembly of the engine revealed no pre-impact malfunction or failure. But a search of the plane’s maintenance records found that the last annual inspection of the aircraft was dated in mid-March of 1981 – several weeks overdue. Also, the last annual inspection of the engine was dated in February of 1980 – two years overdue. In April of 1983, the NTSB concluded the probable cause of the accident was undetermined, and that the pilot’s airspeed was not maintained, entering an inadvertent stall.